Hull City slipped out of the FA Cup with a disastrous second-half performance at the four-fifths empty DW Stadium, turning round a 1-0 half-time leading into a 4-1 thumping. Phil Brown made his intentions to avoid a replay obvious with his team selection, packing the midfield with players with attacking intent and barely a thought for tackling back. So we were either to blow them out of the water with an attacking blitz or would be overpowered in the middle. For a while it looked like the former but once Charles N’Zogbia entered the fray and tore Zinedine Kilbane apart, it was the latter. The feeble attendance was widely derided in the newspapers, but in Hull City fans’ defence the weather going across the Pennines was scarily bad, yet a reported 1500 away fans turned up to watch a bunch of fringe players and out-and-out reserves. 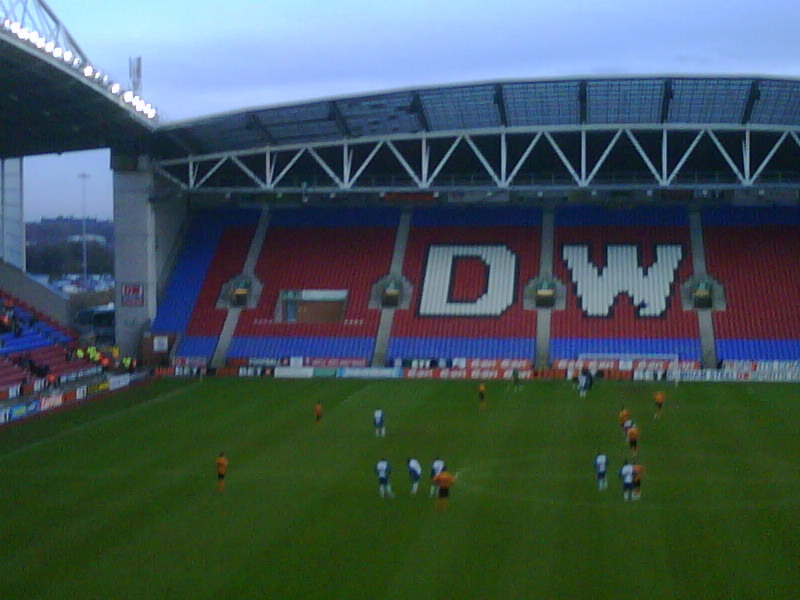 It was the Wigan public who failed to show – but let’s be honest, watching Hull City reserves is hardly a crowd-puller anywhere, let alone in a small town like Wigan with loyalties split between rugby and football. Thought: It’s high time that the draw for the FA Cup third round was changed. So many clubs draw a side in the same division as them, and who wants to keep playing the same side over and over? We’re not Scotland. The ‘magic of the FA Cup’ isn’t in Premier League team V Premier League team; it’s seeing a big team going to a tatty ground in a small town to play on a sloping, greasy surface against players who put in the best performance of their lives. And for fans, it’s a welcome chance for some variety, the thrill of the unexpected, visiting somewhere new. In the first and third rounds only, the FA should have two pots – highest placed teams in pot A, lowest in pot B. A team from pot B – which in round 3 would be a lower-league or non-league side – would always be pitted at home against a bigger team. For all other rounds, it’s the normal open draw. Back to the match. Songs-wise, the fact that there were few if any of the usual daytrippers among the City contingent meant it was a good atmosphere, with plenty of airings of odes to former heroes. It’s been suggested that cup games from now on are deemed ‘retro song days’, though with our cup record that amounts to two games a season. Of the players, young Tom Cairney impressed again – almost as much as Peter Halmosi stank. Apparently, the stench of Halmosi was so bad, grounds staff had to spray Febreze wherever he’d been on the pitch. That amounted to a four-metre square out wide because the odious man doesn’t do running or tackling back for a measly £20k a week. The day Halmosi – or as I prefer to call him, Ryan Williams with hair gel – exits our club, we’ll be dancing on the streets of East Yorkshire. Watch highlights of the match here.